Surface refinishing is a fast and affordable way to repair and restore bathtubs, tile showers, vanities, sinks, tile floors and kitchen countertops. We refinish your fixture in place. This saves you the hassle of demolition and the expense of replacement. In 2-3 days you will have a beautiful kitchen or bath and wonder why you hadn’t done it sooner! Click on our Refinishing Guide or read below for the answers to some questions you may have. Why should I consider refinishing? Surface refinishing is a cost effective makeover alternative to replacing a bathtub, countertop or tile that is worn out, damaged, hard to clean, or simply the wrong color. Miracle Method will repair chips or cracks and restore the surface to look and feel like new. You’ll save thousands of dollars and avoid days or even weeks of demolition mess and costly replacement. What surfaces can you refinish? How much money can I save over replacement? Refinishing can save you up to 75% over the cost of replacement. Bathtub replacement starts with a new bathtub, which will typically cost between $200 and $500. However, the total cost to install can be $3,000 or more! View more information on our national website. What kind of repairs can you make? Bathtub repair can be performed on many types of tubs including porcelain, fiberglass, acrylic or marble. We can repair chips and cracks. Refinished countertops by Miracle Method can be repaired if accidentally scorched or chipped by sharp knives. Tiles that have been chipped can be repaired before refinishing. Missing grout will be replaced before refinishing. Refinishing has an added benefit of sealing the grout. A standard size bathtub, in reasonable condition, takes only 3 to 5 hours to refinish. The tub will typically be ready to use within 24 hours, or even sooner with special curing procedures. 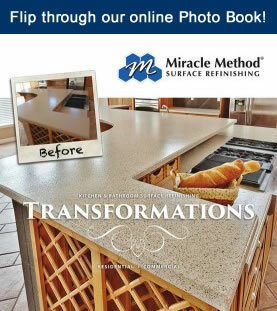 Miracle Method offers two countertop & tile finish options. The first is a solid color or speckled finish that takes 3 to 5 hours and is ready to use the next day. The second option is our Natural Accents™ stone finish. An affordable upgrade, Natural Accent™s typically takes two days to apply and an additional 24 to 48 hours to cure, depending on humidity and ambient temperatures. Bathtub refinishing topcoats contain solvents, which are necessary to make the finish hard and durable. We use special ventilation fans to exhaust air from the work area outside, minimizing the fresh paint like odor. 80% to 90% of the smell will be exhausted within the first 4 to 5 hours and substantially gone within a day. A Miracle Method refinished bathtub or tile wall should easily last 10 to 15 years using the same care and maintenance instructions recommended by new bathtub manufacturers. Our MM-4 bonding agent creates a chemical bond between old and new surfaces, assuring you long life for your refinished tub. A Miracle Method refinished countertop should easily last five to ten years using the same care and maintenance recommended by laminate, tile and man made surface manufacturers. Miracle Method uses the most technologically advanced coatings available. These finishes are designed to stand up to daily use and do not require special care. However, like any bathtub, laminate, tile or man made surface, a refinished surface can be chipped, cut or burned if it is abused. However, unlike these other surfaces, Miracle Method can repair and return a refinished surface to like new. Does it require special care? Will the surface look painted? The deep gloss of a Miracle Method refinished bathtub resembles new porcelain. In fact, most people will have a difficult time telling any difference between a new bathtub and a Miracle Method refinished tub…the Miracle Method process is that good! A Miracle Method refinished countertop resembles new laminate. 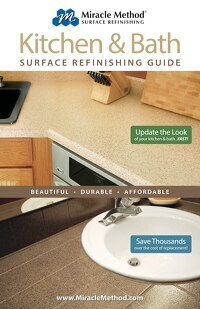 If refinished in Natural Accents™, the new surface will resemble the more expensive natural stone or Silestone. Most people will have a difficult time telling any difference between a Miracle Method refinished countertop and a newly installed laminate or solid surface countertop. Yes! We offer a five-year warranty for bathtubs, wall tile and fiberglass units. This warranty covers workmanship, peeling or other failure of adhesion of the new coating. On our countertop refinishing we offer a five-year limited warranty against adhesion failure. Ask for a copy of the warranty when you are given an estimate. Why should I select Miracle Method? We offer superior adhesion, superior finish & feel, superior craftsmanship, superior service, superior reputation and track record, superior materials and superior procedures and techniques. To read more visit our national website.